Sometime in the early 1990’s, after completing a grueling campaign game of Advanced Third Reich I said to myself, “OK, I’m done with World War II European Theater games”. Not that they weren’t a lot of fun to play, but between The Russian Campaign, Battle of the Bulge and the various incarnations of Third Reich, I had burnt myself out on the period. So when I was given the opportunity to play Blocks in the East (BITE), designed by Emanuele Santandrea and published by Vento Nuovo Games, it had been quite a while since I had parked myself in front of a grand operational scale “Big War” (WWII) type of game. And I was actually looking forward to it. I’m not going to spend a lot of time describing the historical period depicted in the game, as you can find that type of “back of the box” description anywhere. Suffice it to say that the game is a strategic/grand-operational treatment of the World War II German invasion of the Soviet Union and covers the conflict from inception in 1941 to its grim conclusion in 1945. It is a “block” game, which means that it uses wooden blocks to represent the various combat units involved in the conflict. Each block has a sticker affixed to one side which identifies the unit type, characteristics and strength, and the un-stickered block side is faced toward the opponent thus hiding the unit’s capabilities until some type of contact is made (combat, reconnaissance, etc.). Map hexes are used to regulate block unit movement. There are two levels of play: Basic and Advanced. The Basic game is primarily a grand-operational, low complexity simulation, while the Advanced game introduces more complexity as well as some strategic elements, such as resource mining and fuel allocation. Rounding it up are a set of Optional Rules that add realism to the simulation, at the cost of added complexity. Players are free to pick and choose Optional rules as they see fit. It is basically a two player game although, in some of the larger scenarios, the game situation lends itself well to a distributed command where more than one player can play on each side. Each game turn represents one month of real time so the full campaign game can be quite lengthy. However, there are 9 scenarios that range in play time from 1 hour to 40+ hours, so it’s not difficult to find one to suit your preferences. Visually, Blocks in the East is very appealing, from the game box to the rules manual to the map and unit counter graphics. Vento Nuovo set out to make a beatiful game and, well, mission accomplished. But I’m not one to be swayed by a beautiful exterior alone. So, I cleared my game table to accommodate the oversized 34″ x 49″ BITE game map and dove right into it… right back to the “Big War”. My first impression when I received the game was that it was absolutely gorgeous. You can see that a lot of time and effort went into the design and production of the game box, the rulebook, the map, the blocks and counter artwork. While the map is visually pleasing at first glance, on closer inspection I noticed that some information is hard to decipher. For example, the boundaries of the various Soviet Military Districts are quite difficult to identify, as were the German Army Group boundaries. It seems they are delineated with colored dots in the corners of the hexes that form their perimeter, but I found it hard to determine with any certainty. Fortunately, the Barbarossa Standard Setup graphic on the back cover of the rules manual shows the various Soviet Military Districts and German Army Group setup boundaries with color shading, which is much easier to follow. 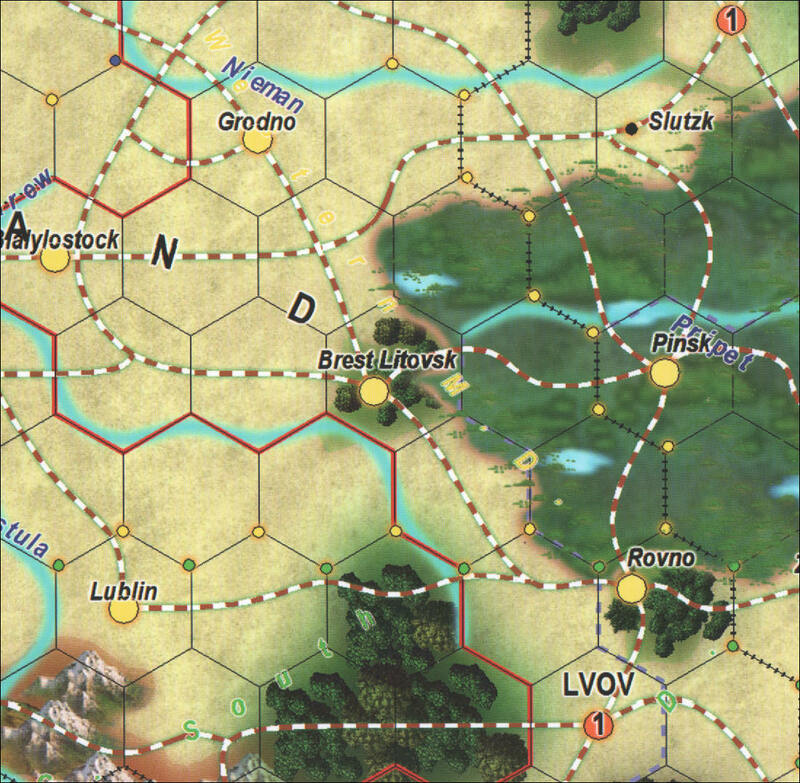 In other places, hexes have dotted lines and colored dashed lines along the hexsides, and other graphical cues and icons that are not explained anywhere on the mapboard terrain chart. I would prefer that the terrain key have explanations for every terrain feature, hexside feature, and symbol that appears on the map. A number of the players in my gaming group found the map a bit confusing at first. I think a more complete Terrain Chart would have helped. Note: a quick response (one of many) from the designer informed me that some of the colored dashed lines indicate starting boundaries for certain scenarios. Sure enough, some of the scenario descriptions do, in fact, mention the dashed lines. But, again, I would rather not have to flip through the rule book to find out what a map symbol or feature means. As a minor criticism, I’d say that the hexes are not large enough to accommodate four blocks (the stacking limit) without overlapping into adjacent hexes, so you occasionally find yourself looking at large sections of the map completely crammed with blocks so that you can’t see a bit of the map underneath. There are no hex numbers on the map which I assume was a design choice. I’m not sure I’d want to spoil the look of the map and make it even busier than it is either. But, it would have been nice to have hex numbers to use for scenario setups, and when clarity of placement was important. Most unit blocks have colored dots on them that tell you which setup area they belong int for the 1941 or campaign scenarios, which is really helpful. The dot also indicates the starting rotation of the block (dot always positioned at the left-bottom corner for the Soviets and right-bottom corner for the Axis). For the most part, the unit counter graphics are crisp, clear and easy to read. However, in a very small number of cases, unit counter graphics either overlap or color-blend with text on the unit counter, making it difficult to read. The only other minor issue we had was with the process of affixing the stickers to the wooden blocks. Beyond the obvious pain of having to affix 300+ stickers, correctly aligned, to wooden blocks, there was some confusion as to which stickers belonged on which color blocks! But, once again, Vento Nuovo was on the ball, and had a list on their web site that clarified the matter. The only complaint I still have is that making blue labels for the air forces of both sides was probably not a good design decision; each should have had its own color for air units. All nitpicking aside, the components are all top quality, and appear to be durable. So, from a physical components point of view, there’s no doubt that you’re getting good value for the $100+ price tag you’ll pay for this game. The original rules had some holes in them, as is common for new game systems, so our first attempt to play BITE did not go as smoothly as it could have. Although I normally applaud efforts to keep rules streamlined and non-repetitive, the original rules may have been too streamlined. While the Basic Game rules took up less than 10 pages, we ran into a few situations where the rules were not totally clear. Once more, Vento Nuovo was right there with rules clarifications and assistance that cleared things up quickly. I often received email replies to my questions within an hour of sending them. For example, we couldn’t tell which air units represented “fighters” and which were “bombers”. All air units have a picture of an aircraft on them. Unless you happen to know the silhouette and profile of every WWII aircraft (and I believe the guys at Vento Nuovo do), you have no way of knowing if it’s a “fighter” or “bomber” type unit, an important distinction in terms of the air unit’s capabilities. We learned from the designer that, for the major powers, fighters have light blue backgrounds, bombers have medium blue backgrounds and long range/strategic bombers have dark blue backgrounds; but it was not easy to differentiate, in my opinion. And for the minor powers (Hungary, Romania, etc. ), the sticker could be any color, but fighters have a letter “F” somewhere on the counter while the bombers have a “B”. There were a number of other areas where the rules were poorly worded or vague and we had some questions about the setup instructions in the Scenario Booklet (which is not actually a separate booklet, but just a section of the main rulebook). As mentioned earlier, trying to identify the boundaries of a “Military District”, for setup purposes, was not easy. And I sometimes questioned which units should be set up for a given scenario. For example, the “Road to Leningrad” scenario instructs the Soviet player to “set up according to the standard setup but only deploy the Baltic and Leningrad Military Districts…”. Which was fine. The setup sheets identify groups of units under the headings of “Leningrad M.D.” and “Baltic Military District”. However, there are also units designated for the city of “Leningrad” itself. And other units designated for cities like “Riga”, which exists between Germany and Leningrad. Were these units required to be set up as well? I found it hard to believe that a scenario called “Road to Leningrad” that listed “Leningrad” as a victory objective would exclude the units designated for setup at “Leningrad”! But that is the case, and the setup instructions are meant to be followed exactly as written. The designer explained that the short scenarios are meant to be learning scenarios and are not intended to mimic historical unit dispositions. Also, it must be noted that, for the larger scenarios, there is a Scenario Setup Chart that is much better organized and easy to follow. Once we got past these initial issues, we found the game rules were fairly well written and the game proceeded without any major “rule-searching” delays. The rule book’s Index is pretty comprehensive and I did not have any trouble locating rules for any topic that I needed to look up. The support we got from Emanuele at Vento Nuovo was just fantastic and was greatly appreciated. Before you play the game, please check their web site and make sure you’ve got the latest version of the rules (v3.0 at the time of this writing). These guys actually listen to their customers and welcome suggestions and criticisms if it helps makes their product better, so they often publish new player aids and charts that improve game play. Check often for the latest and greatest. One of the things I enjoyed most about this game, as opposed to other WWII games, was the game turn Sequence of Play and the Combat Phase action. I’m not saying that it’s a “revolutionary” new approach to war gaming, but they seem to have hit on just the right sequence of actions to bring eastern front WWII combat to life. Several players commented that the game system was akin to EastFront (by Columbia Games), but was a bit more complicated in some areas and simpler in others. I’ve never played EastFront so I can’t comment from “hands-on” experience, but I did read through the EastFront rules, comparing the sequence of play and combat phases. I think that, overall, BITE‘s Sequence of Play makes for a more exciting game (more on that in another article). Basic stuff. Units must be able trace a supply line back to a valid supply source or face reduced movement and combat capabilities, culminating in surrender (elimination) if the unsupplied condition is not corrected by the end of the player turn. Players spend Production Points, the basic units of currency, to create new units or repair existing units. Depending on the level of play (either Basic or Advanced rules), this phase can be very simple or somewhat complex. Standard movement actions, except that units must enter enemy hexes to initiate combat (adjacency is not sufficient). Air units are moved to support combat actions at this time as well. A key phase, allowing the defender to send air units to support critical combats. As with many block games, combat units are rotated so that the number representing the current Steps (or combat strength) of the unit is showing at the top, or north, edge of the block. The number of steps determines how many dice a unit may roll while attempting to score “hits” against the enemy. The unit type (e.g. infantry, armor, artillery, etc.) determines the “hit” number. So, for example, a unit with 3 Steps and a “hit” number of “5” would roll three dice in combat and score a “hit” on the enemy for each 5 or 6 rolled. Blocks in the East introduces the concept of Tech Levels (or Technology Levels) that determine what a unit’s “Hit” number is. So, for example, an Axis infantry unit at Tech level 3 has a “”Hit” number of 5, meaning that it scores hits when it rolls 5 or 6, while a Soviet infantry unit at Tech level 1 has a “Hit” number of 6. It therefore only scores hits on rolls of 6. In the Basic game rules, the starting Tech Levels are fixed and advancement happens on a fixed timetable. With the Advanced Rules, however, players can control the rate at which they advance to higher Tech Levels by spending Production Points. Of course, this type of spending will reduce Production Points available for other activities such as combat unit replacements, etc. Air-to-Air Combat Step – Fighters duke it out for control of the air space over the battlefield. Anti-Aircraft Fire Step – All ground units may shoot at aircraft that survived the Air-to-Air combat. It’s a tough Step for the air units (more about this later). Air-to-Ground Combat Step – Surviving bombers may bomb ground units and some fighters, depending on Tech Level, may strafe ground units. Artillery Fire Step – Attacker fires first and defender suffers casualties before defending artillery (if any survive) may return fire. Ground Combat Step – Defender (non-artillery) fires first and attacker suffers casualties before attacker ground units (if any survive) may return fire. Combat in BITE is quite bloody; casualty rates are high. The “front lines” become quite fluid and don’t remain static for long (as one would expect from a Russian front simulation). Taken together, the combat process works really well and moves the game along nicely. However there were some specific portions of it that I thought were a little overdone, namely the “Anti-Aircraft Fire Step” and the “Artillery Fire Step”. I feel the Anti-Air strength of ground units is excessive. In the early stages of the game, you end up with Artillery and Infantry having essentially the same anti-aircraft capability (“Hit” number = 6). Armor units score anti-air hits on a roll of 5 or 6! Enemy aircraft must endure this withering fire before they even have a chance to attack opposing ground units. Imagine a hex containing a 5-step Armor unit, a 4-Step Infantry unit, a 4-Step Artillery unit and a 5-step air unit (fighter). An air unit attacking this hex would have to survive air combat against the fighter, then anti-aircraft fire by the ground units (8 die rolls with “hit” # of 6; 5 die rolls with “hit” #s of 5 or 6), before even attempting to strike at the target enemy ground units. I have to wonder, were artillery units really shooting down many high altitude bombers in 1941? The designer’s response to this was that the anti-aircraft process also factored in abstract things like aircraft wear and tear, poor maintenance and overuse, which I suppose makes sense but, in the games we played, air power was largely ineffective in supporting ground combat. I thought it much wiser to use air units for Air Reconnaissance when playing with the Advanced Rules. But for the Basic game, it might have been better to just use abstract “air points” rather than having blocks representing squadrons. I also shared the opinion with some of my gaming pals that Artillery was much too potent a weapon. Keep in mind that Artillery Fire is not simultaneous. Attacking Artillery fires first, and defender casualties do not get to fire back. This resulted in far too many cases where defenders were simply blown away without even having the opportunity to defend. I understand that the majority of combat related deaths in WWII were caused by artillery, but I’m not sure there were many instances where artillery just vaporized entire enemy formations (correct me if I’m wrong). Now we come to the heart of what makes this a WWII Eastern Front game. “Blitzing” allows armor units, that were engaged in ground combat, to spend 1 movement point in pursuit of retreated enemy units. Since most non-clear terrain hexes cost more than 1 movement point, Blitzing is effectively restricted to open terrain (i.e. good tank country). This phase also provides the final opportunity to break through to friendly formations that may be surrounded by enemy units and open up a supply line before they are forced to surrender (i.e. eliminated) due to lack of supply. Obviously, Blitzing is also the best means of opening a seam in a defensive line that can be exploited. Any unit that was marked “Out of Supply” earlier in the game turn is now checked again. Any unit that is still out of supply is considered to have surrendered and is removed from the map. In addition, a Production Point penalty (the specifics of which depend on the game level; Basic or Advanced) must be paid by the surrendering unit to the victor. Finally, supplied armor units are afforded an opportunity to truly “break out”. They may spend their entire movement point allowance, but may not enter an enemy occupied hex (i.e. may not initiate combat). The combination of Move-Attack-Blitz-Exploit makes for very exciting combat sequences. And, best of all, the Blitz/Exploit capability is not exclusive to the German player (although the Russian ability is somewhat diminished until they reach Tech Level 2). So both players must be constantly vigilant or they may find large segments of their army surrounded, cut off from supply, and on the brink of surrender. The grognards among you (and you know who you are) will delight in the supplemental realism provided by the Advanced and Optional rules, but I must confess I found the Basic game to be just as enjoyable. The Sequence of Play furnishes a nice flow that keeps the excitement level high and does not bog players down with minutiae. It’s not that I have a problem with complex games; quite the opposite. But, for this game, I found that the bookkeeping exercise of tracking various types of Production Points didn’t add any excitement to the contest. It’s just a matter of personal preference, and my point is that this game has something for everyone. I’m not averse to selectively choosing Advanced and Optional rules, however. I find one of the Advanced Rules, “Weather”, to be essential for two reasons, (1) Weather rules add quite a bit of realism to a game without adding a lot of complexity, and (2) Weather rules enhance replayability, because each game can have a unique combination of weather events. Since the Weather rules only require you to roll for weather in the months of May and October, it doesn’t totally turn the game upside down, but it does force the German player to modify his behavior in preparation for possible bad weather in those two critical months. Feel free to pick and choose Advanced and Optional rules “a la carte” to maximize your enjoyment of the game. There were some problems with the original rules (as mentioned earlier) so players should make sure they are using the latest rules (currently v3.0). I found that almost all the errors, omissions, inconsistencies and confusion in the original rules were addressed (and/or fixed) in the version 3.0 rules. Most importantly, the game is fun to play! We sometimes forget that we’re supposed to be having fun, and not just evaluating a simulation. But I really did enjoy it and we all got caught up in the fast-moving action, and lost ourselves in it for a few hours. What better value can you get from a game? It’s obvious that, for Emanuele Santandrea and the folks at Vento Nuovo Games, Blocks in the East has been (and continues to be) a labor of love. A measure of a game company’s commitment to a product is the manner in which they support it, and Vento Nuovo’s support of BITE has been nothing short of spectacular. They have responded quickly to criticisms as well as suggestions for improvement, and quickly released two new rules revisions so gamers will reap the benefit in improved game play. Considering that Vento Nuovo intends to release additional “Big War” games based on the BITE game system (“Blocks in the West”, “Blocks in the Pacific” maybe? ), I think we can expect the level of support and commitment from the company to remain high. Once all the final kinks are worked out, I believe Vento Nuovo is going to have a best-selling series on their hands and the gaming community will have another reason to get together on Friday nights. Posted in Blocks in the East and tagged Emanuele Santandrea, Vento Nuovo Games, War Game, War Game Review, WW II Game. Bookmark the permalink. Emanuele (the designer of BITE) and I were discussing the review and we thought it would be very helpful if your article can be posted under the BITE review section on Boardgamegeek. Not only will your article be very helpful to possible newcomers to the game, ypu can also explicitly refer to ‘the boardgaming life’ website. I suppose a win for you, boardgamers who are potentially intetested as wel as the the boardgaming life website! Anyhow, Emanuele told me he is a very happy with a quality review like this and he would be pkeased if this can be posted on BGG as well. Thanks again for the great review and I would be greatful if you can let me (or Emanuele) know if this can be pisted ob BGG (If you don’t have time, we can do it). Thanks for the encouragement and the offer to spread the word about our site. However, as a rule, we don’t post our articles on other sites. We do use the “Links” section of BGG to add links to our articles, which I believe is what they prefer. I’ve seen other posts on BGG where our articles were mentioned, but you’d have to check with BGG to find out their policies.